Afro Hair Products Outlet are happy to stock the fantastic Aphogee Kertain 2 Minute Reconstructor 473 ml. With so many on offer these days, it is great to have a name you can recognise. The Aphogee Kertain 2 Minute Reconstructor 473 ml is certainly that and will be a perfect acquisition. For this great price, the Aphogee Kertain 2 Minute Reconstructor 473 ml is widely respected and is a regular choice for lots of people. Aphogee have provided some excellent touches and this means good value for money. This rich mix of keratin amino acids, botanical oils and vitamins restore flexibility and softness to dry, fragile hair. In minutes, it permeates and repairs damage brought on by chemical services, styling and heat. Dry, Itchy Scalp is gotten rid of. Even bleached, permed or relaxed hair feels healthy again. ApHOGEE Intensive Keratin Reconstructor assists displace mineral deposits from swimming pools and hard water. This unique treatment is formulated with magnesium and customized proteins which fuse into the hair with the application of heat. The result is that damage is drastically reduced. 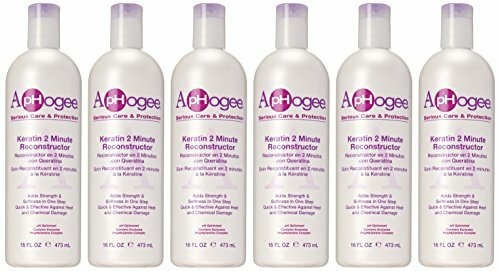 ApHogee Two Step Protein Treatment is a beauty parlor service item unlike any item offered for at home usage. Throughout the process, ApHogee treatment solidifies into the hair, dramatic evidence that something special is happening. For best results a hooded dryer is required. After rinsing and moisturizing with ApHogee Balancing Moisturizer, customers are amazed with the results. ApHogee Two Step Protein Treatment can help improve other salon services. This remedial process is extremely advised for hair that: Is too weak or great to take a perm or relaxer. (utilize the week PRIOR to service) Is over bleached. Will not hold color. (usage PRIOR to color application) Breaks when combed or brushed. Is mushy when wet and fragile after drying.